The Delta is another example of how a good car can be a complete flop. It has everything to be a success: modern and fancy exterior, fine interiors, roominess, and excellent engines. Its problem: high prices. Its sin: to be a Lancia. In 2012 the brand sold 14.000 units of this compact car, which is nothing at all. Is half of the already low numbers of the Fiat Bravo. 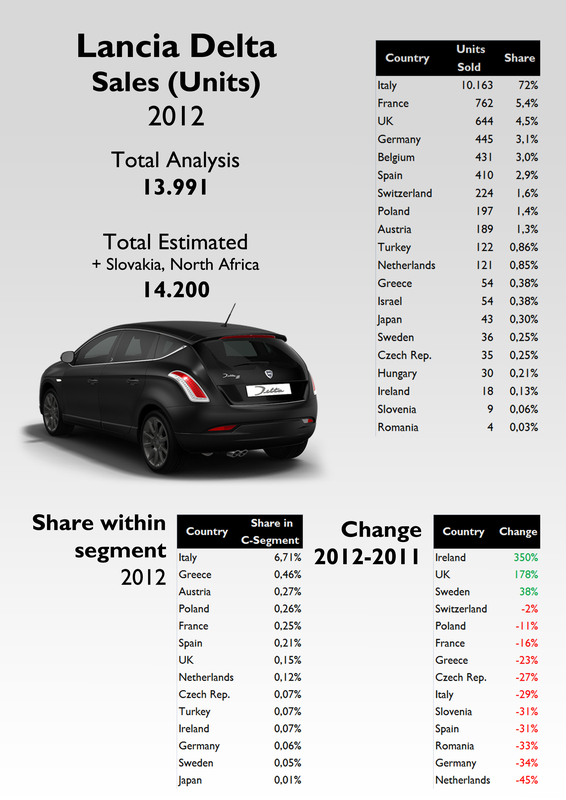 This number includes the registrations of the model using Chrysler logo (in Japan and the UK), and of course Italy counts for a big part of them. 73% of the Delta’s sales took place in its home country! Then comes France, the UK, and Germany, but all of them are really far away from Italian numbers. It is a car that only worked in Italy during its first years, but last year’s results confirm that the end is soon. The production will stop this year, and the possible successor won’t arrive till 2014, when a possible Chrysler 100, developed by Lancia and Chrysler, will be presented and exported to Europe as a Lancia. 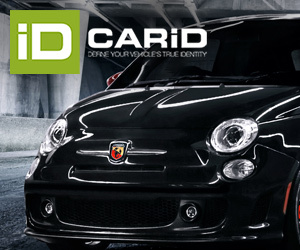 But then, Fiat must think of a repositioning of this model along with the brand. If they keep doing the same they will obtain the same: low sales and non profits. I see Lancia is not present in Denmark. If you click on http://www.lancia.dk you get a generic chrysler lancia site with “atmospheric’ background track. I do believe Lancia should have enetered the Uk as Lancia and not as Chrysler. The Irish would buy neither as the figures for this year show, but the Brits would have preferred a Lancia Delta I am sure. They also should not have changed the grille to be this Chrysler style one. The previous proper Lancia grille was much more stylish. The answer to a question i never asked. I want a successor of The iconic Delta HF integrale! In my opinion, the way Fiat tried with the Bravo- Delta-Giulietta trio is not as bad as fatal was trying it without the power beyond (infinite sources of money – and this is also true for the three brands and their diversification/positioning from the ’90s). They started their challenge with an apparent handicap. Thay had a good start, but run out of resourses. The situation needed money pump soon after their debut to get buyers thinking of the models as a valuable alternative in their segment. And the segment is not comprises only of one bodytype! No hatchback, sw or open variations. Abarth has no variant of the Bravo, making no competition of the Giulietta, apparently. But the other successful competitors have all bodyworks or at lest a sporty variant. Lack of bodyworks means lack of success in a model’s segment. This is what is truely seen in the case of this triga. An sw variant for the Bravo, a HF hatchback or a cabriolet for the Delta and a three door QV or sw QV alternative for the Giulietta could have preserve the image of the brands better. 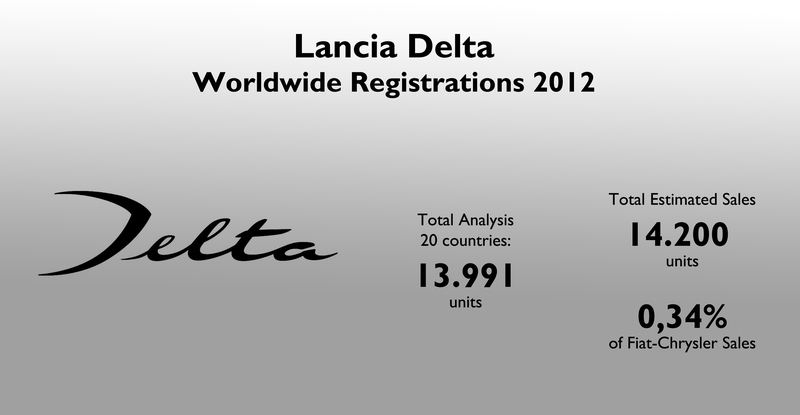 There are no variants of the Delta, but not even all models of the brand are available in every market! And it may not only true for Lancia! This strategy destroys further the turnished images! If there is no supply, the demand can not result in sale numbers! Very bad marketing… Fiat shoud take better care of it, otherwise the QP and Ghibli will also fail. I think, Fiat can build on 500 from the bottom, and Maser from the top to get volumes. Using the platform of the Ghibli for the Thema and 300 as its cheaper alternatives in Europe and overseas with luxury aspirations would provide genuineness for them easing their competition. It is said that the new Granturismo will have a smaller platform. The current platform of the soon retired Granturismo and Grancabrio with only s4 and v6 engines with much more cheaper price-tags would suit a Flavia much more better! In the middle, the Linea would be suitable with better engines not only in India to compete the fluence and octavia. Salve! Essentially Marchionne chose to stop investment, so there are no new models and no new variants. Ignoring the Volkswagen case (VW has a much different cash flow situation), we should instead compare to Ford: Alan Mulally maximized the company’s cash situation on the even of the financial crisis by selling some assets and borrowing against others. The result is that Ford had the capital to invest in new models, survived the crisis without bankruptcy, and is now in a strong competitive position. As for that Ghibli platform being used for the new Thema and 300 … it’s the same M139 platform used by Quattroporte, GranCabrio, GranCoupe and 8C, since 2004. It’s 10 years old now, and has never been used for a volume production model, so I have my suspicions whether it can realistically (and cost-effectively) be used for models such as the full-sized Chrysler ones. The 300, Charger and Challenger together sell about 20,000 units per month, almost 3x the current ANNUAL production of the M139 platform. Of course, we’ll have to wait and see what the real answer is, I could be wrong on this. If you had launched the new delta and the promised four wheel drive on new floor pan intergralia into the uk, in and through the alfa dealerships orders only to catch peoples attentsion , your sales figs would have gone though the bloody roof, had lancias for years bit disappointed considering what a great pedigree steve. England. was in Italy 2 years ago, too many german and French cars on the road, what happened to the passion you guys had in years gone by. I know. It’s a pity that Italians are no longer as passionate as they were some years ago. The Italians are passionate about German cars. That’s perhaps why so many Italians want to sacrifice their own auto industry to the Germans.